Impossible is simply a challenge for the free-thinking. That’s my way of thinking, anyhow and I’m always looking for ways to push the envelope. Defying gravity (visually, at least) is one way to push the limits. 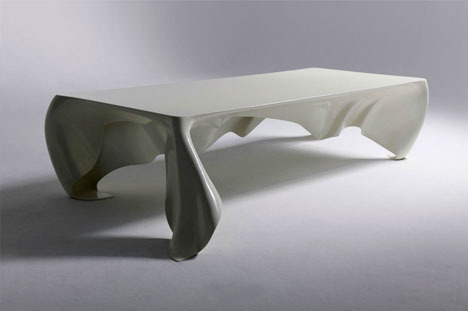 By extending the “tablecloth” down to the ground and eliminating legs, this table appears to float. PS: Nana, who works for the stilwerk limited edition design gallery informed me that Brad Pitt recently bought one of the nine tables made.